Few emblems are as iconic as Mercedes-Benz’s three point star, but the well-coiffed and bouffant moustache of Dieter Zetsche is almost as recognisable. Daimler AG’s chairman was actually born in Istanbul. Later, in Germany, the young hotshot acquired a degree from the university of Karlsruhe in electrical engineering. Zetsche first entered Daimler-Benz, as the group was then known, in 1976. Initially, he worked in the research department and was later invited to assist a development manager in the commercial business unit. Advancing quickly within the fortress of the prestigious car manufacturer, he was soon relocated to Brazil to head Mercedes’ engineering and product development centre. While Zetsche is clearly blessed with technical know-how, he also has a talent for languages and is reportedly fluent in English, French, Latin, Portuguese, and Spanish. By 1998, the German was part of the executive board as Chairman, a position which, once appointed he’s maintained ever since. Up until then, the situation had been comfortable, both for the multilingual talent and the car manufacturer that had mildly revolutionised the industry with the launch of such distinctive models as the compact 190 and the W124. Mercedes-Benz had come to represent both high quality and innovation. However, with shifts in the market and mounting competition from BMW, as well as manufacturing problems that brought about too many recalls, the popularity of the brand faltered. In 2000, Zetsche joined the Chrysler Group as president and CEO, and in 2006, he succeeded Jürgen Schrempp as Chairman of DaimlerChrysler – the company’s new name after Daimler and Chrysler joined forces in 1998. One of his top priorities was to make the co-operation between Mercedes-Benz and the Chrysler Group run smoother. “Early on in my new assignment, I pushed the organisation to leverage the merger to the maximum extent,” Zetsche said in a press statement at the time. But the plan backfired, as it only served to highlight the incompatibility of the two wildly different automobile names and their somewhat pointless union. In 2007, it shattered in a breakup that reflected quite badly on Zetsche, not least because it involved a great many redundancies. That aside, the list of Zetsche’s achievements far outshines his setbacks. He’s been credited with the successful revamp of Mercedes-Benz, an operation he was brought in to lead back in 2006. In recognition of his strategic abilities, Time magazine awarded him a place on its list of the world’s most influential business leaders the same year. In every business leader’s career path there will be fluctuations, but Zetsche is more familiar with this than others. In September 2011, Reuters announced that German public prosecutors were investigating Daimler’s top man on suspicions of involuntary manslaughter. The case involved a fatal accident of a 27-year old engineer. The incident caused by allowing an intern the use of a test track. The family of the deceased man stressed that the intern should not have been invited to use the test track, and the investigation stemmed from their reporting of the case. Much to the relief of Daimler and their front figure, it was decided that Zetsche was not to be held responsible. The issue of fuel efficiency is also high on his agenda. Battery powered cars including the much-hyped Nissan Leaf model, are very prolific right now, but Zetsche is trying to entice people to consider hydrogen power instead. Zetsche argued last year that the system in which fuel cells convert hydrogen to electricity was the only way to preserve the range, power and comfort that drivers were accustomed to, saying “It offers everything you’re used to in a car except emissions.” Moreover, every country can produce hydrogen, an element that has unlimited availability. 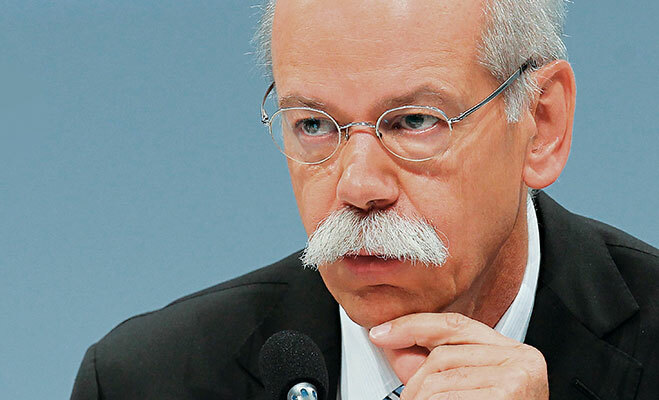 All qualities considered, Zetsche has deemed this the most democratic fuel. Putting technology to the test to impress the industry and potential consumers alike, Mercedes-Benz has launched the F125, a model that runs on a combination of fuel cells and battery power. The full-size luxury car stores hydrogen fuel in the body panels, and has a range of roughly 600 miles. While the concept behind it is laudable, it’s not ready to hit the market anytime soon. Hydrogen power will only become a viable option once a network of fuelling stations has been introduced. So why is Zetsche so enthusiastic about this particular form of power? The Daimler group also produce trucks under the Freightliner brand, and therein lies the problem. Increasingly expensive fuel prices pose a more definite threat to this business sector, as running these mighty vehicles with battery power would be near impossible. In the course of his career, Zetsche has seen companies fall in and out of favour with consumers, despite boasting strong foundations. Learning from experience, he knows that the ability to think ahead is a vital tool for survival.